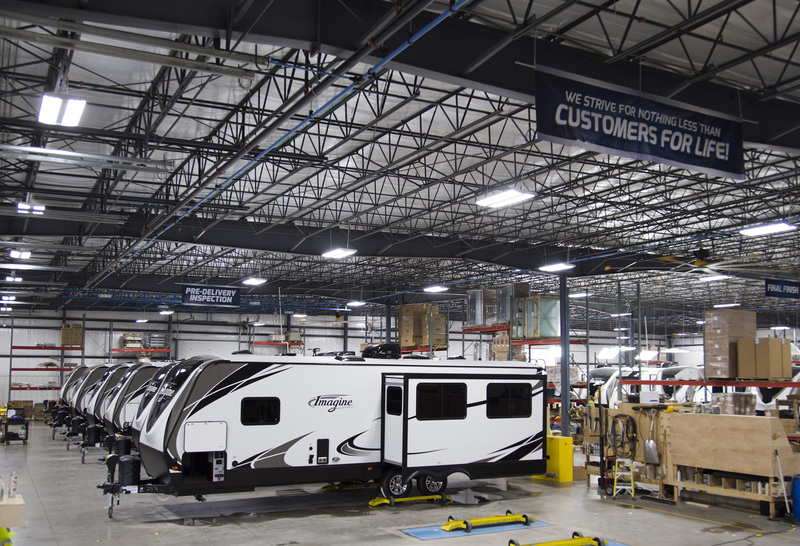 Grand Design RV® announces production of their 40,000th towable recreational vehicle. In October 2016, Grand Design announced production of their 25,000th unit and just 9-months later they have reached another milestone with their 40,000th recreational vehicle being produced. In addition to this production milestone, retail customers are continuing to embrace Grand Design brands resulting in strong year over year retail unit sales growth of over 61% through May of 2017, according to Statistical Surveys Inc.
“It is humbling to see all of our brands continuing to have such notable growth in their respective categories. All three Grand Design fifth wheel brands are ranked within the top 10 models for highest year to date retail units sold in North America, which is a true testament to our innovative product designs, quality built products, the hard work of our dealer partners and ultimately the retail customers support,” stated Don Clark, President and CEO of Grand Design RV.